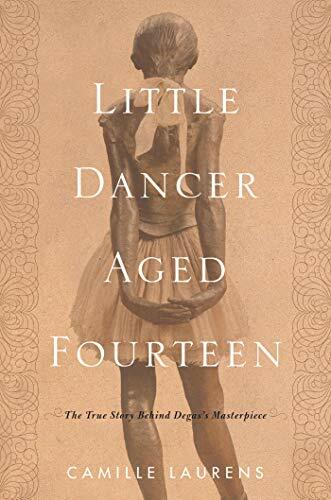 Spinning gracefully off the shelves and leaping quickly to the top of the art biography bestseller list, Little Dancer Aged Fourteen: The True Story Behind Degas's Masterpiece deserves all the attention it has been getting in more ways than one. Edgar Degas’ (1834–1917) wax sculpture “Little Dancer Aged Fourteen” was not created in a vacuum; it had a context. That context, set in 1880 Paris, France, is a world away from America today. What we see when we look at her is not what the public saw when she was first exhibited almost 140 years ago at the Sixth Impressionist Exhibition. Laurens, long fascinated by this piece and preoccupied by the meaningful questions it raised for her, has dug into this context in a thought provoking, if sadly realistic, story. The narrative is short, the body of which is a scant 133 snappy fast-paced pages contained to three quick chapters. In the first is painted a bleak picture of the world of Marie van Goethem, the 14-year-old model who posed for Degas. The content marches systematically through a long list of societal concepts this young lady represented: poverty; desperation; abuse; child labor; prostitution; pedophilia; evil; vice; ruination; sexual morals; celebrity; criminality; obscenity; taxidermy; the avant-garde; vulgarity; and tragedy. No wonder polite society saw “Little Dancer Aged Fourteen” as controversial, an affront to their seemingly refined sensibilities. “She was everything and its opposite: the model was a child, but she looked like a criminal; a ballet dancer, but inelegant . . . an admixture of grace and working-class vileness . . . at once sly and untainted, suggesting different interpretations while not being reducible to any . . .” She was an incomprehensible threat from every direction. So what was Degas really up to when he sculpted Marie, intentionally shattering all the rules of art and society? Chapter two positions the artist alongside the model and speculates on the relationship between them, hypothesizing possibilities. Could it really be that as opposite as they were the “Little Dancer Aged Fourteen” is actually Degas’ self-portrait? It is here where the reader realizes that most of what Laurens comes up with is a product of her rich imagination. While based on facts well established within the era, it is still fiction—historical fiction, but still fiction. Admitting this herself, chapter three takes a turn which serves to justify the subtitle, The True Story Behind Degas's Masterpiece, and differentiate her book from other fictional renditions about this same sculpture. Digging into official birth and death records, the author to her dismay finds herself with huge and permanently un-fillable voids. Once Marie left her position as a “little rat” dancer at the Paris Opera, she disappeared into ghostly anonymity. And this is what constitutes the harsh truth about Marie, while the masterpiece based on her life’s story continues to grow in distinction. The paradox speaks volumes and is perhaps what Degas wanted most to impart to fickle and hypocritical Paris. The surprise in the project is how well Laurens’ intoxicating and contagious point of view comes across even through translation, for which Wood deserves a standing ovation (he has actually received awards in the past for his translation prowess). Her creative line of questioning, imagining and postulating would make any art history professor proud. Her smart style of writing would make them grateful. The art history professor, however, is not the audience. It is the general public who is decidedly devouring this Little Dancer Aged Fourteen: The True Story Behind Degas's Masterpiece, an exquisite book about a poignantly wretched little girl and everything she represented.